One node for each source image, if any. One node for each image parameter, if any. Each source image can have its own source and parameters. In an analogy to a file system, source images are like directories and image parameters are like files. When a tree node is selected in the left pane, the content of the right pane is adjusted accordingly. If the node is an image, a "preview" tab is show together with an "information" tab. Informations include the color model, sample model, data type, etc. If the selected tree node is a parameter, then the right pane show the parameter value in some widget appropriate for the parameter type. Constructs a new browser for the given renderable image. Constructs a new browser for the given rendered image. Returns a tree with all sources and parameters for the given renderable image. Returns a tree with all sources and parameters for the given rendered image. Display the properties for the images specified on the command line. Show the operation tree for the specified renderable image in a frame. Show the operation tree for the specified rendered image in a frame. Show the operation chain in the given owner. Invoked when the user clicks on a parameter node in the operation tree (left pane). Invoked when the user clicks on a source node in the operation tree (left pane). source - The last image from the rendering chain to browse. Show the operation tree for the specified rendered image in a frame. This convenience method is mostly a helper for debugging purpose. Show the operation tree for the specified renderable image in a frame. This convenience method is mostly a helper for debugging purpose. image - The last image from an operation chain. locale - The locale for tree node names. The tree for the given image and all its sources. Invoked when the user clicks on a source node in the operation tree (left pane). This method show a properties panel in the right pane appropriate for the given selection. selection - The user selection. 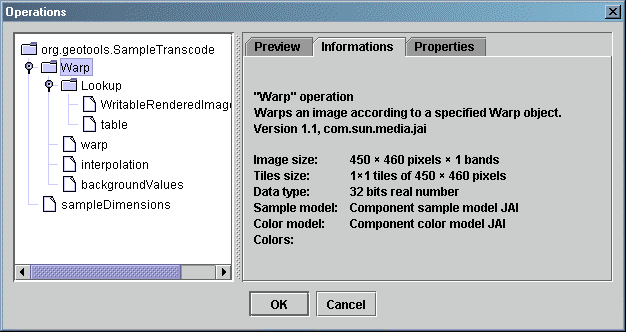 This object is usually an instance of RenderedImage, RenderableImage or PropertySource. if this method has been able to find an editor, or otherwise. Invoked when the user clicks on a parameter node in the operation tree (left pane). This method show a properties panel in the right pane appropriate for the given selection. selection - The user selection. This object is usually an instance of Number, KernelJAI, LookupTableJAI or some other parameter object. owner - The owner widget, or if none. title - The widget title, or for a default one. if the user clicked on the "Ok" button. java.io.IOException - if an error occured while reading an image.